With the twelve-volume series Feasting on the Word, Westminster John Knox Press offers one of the most extensive and well-respected resources for preaching on the market today. When complete, the twelve volumes will cover all of the Sundays in the three-year lectionary cycle, along with moveable occasions.The page layout is truly unique. For each lectionary text, preachers With the twelve-volume series Feasting on the Word, Westminster John Knox Press offers one of the most extensive and well-respected resources for preaching on the market today. When complete, the twelve volumes will cover all of the Sundays in the three-year lectionary cycle, along with moveable occasions.The page layout is truly unique. For each lectionary text, preachers will find brief essaysA--one each on the exegetical, theological, pastoral, and homiletical challenges of the text. Each volume will also contain an index of biblical passages so that nonlectionary preachers may make use of its contents. OK, this is not a book you "finish," but I'm marking it as Read. I'll return to it throughout this church season. 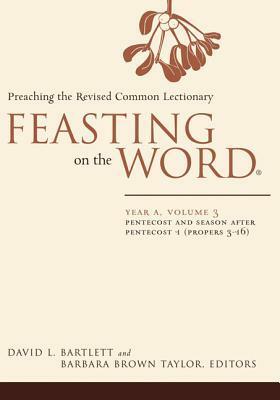 Great not just for preachers but for anyone who wants a little more background on the biblical readings for the week, for churches following the Revised Common Lectionary. Short, not highly technical, easy-to-read commentaries on each of the four Sunday readings thoroughout the season. Another excellent preaching commentary series following the lectionary readings. Since it offers four separate perspectives on each passage, and each of them offers multiple ways of reading each passage, these commentaries can be useful over a lifetime of preaching. This series is wonderful for those who are preaching/teaching along with the Revised Common Lectionary. I loved the four different approaches to each text. Some were more helpful than others, of course, but I would consider this a 'rich' resource for preaching and teaching. The books are pricey, but they are large with very nice paper / readable print. Excellent.